Our City Sleuths activity is conducted in popular cities with great locations for wandering and exploring. 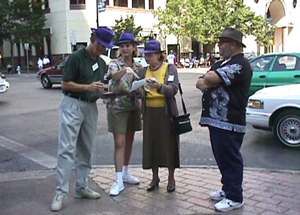 City Sleuths is the intelligent alternative to the standard scavenger hunt. It is designed to reward effective team problem solving and communication skills, build relationships, and provide a fun and challenging experience. In Austin, the program is conducted downtown, in and around the UT campus, and in the Zilker Nature Preserve ­- across Lady Bird Lake from downtown. In downtown Austin you can select program areas that include Sixth Street and other entertainment districts, the State Capitol, the Austin History Center, and the scenic shoreline of Lady Bird Lake. In each location, participants discover fun facts. The activity includes riddles associated with local history and curious artifacts mixed with the weird and humorous. It’s all done in a space that is walkable, with no down time waiting for and riding in taxis or buses. Participants walk away with insight toward better teamwork, and an upgraded informal network among fellow participants that “greases the skids” for working better together in the future. The riddles are entertaining; the answers clever and humorous. They are tested over time, so we know they work without undue confusion. Team sizes are small to ensure everyone stays involved: from 3 to 5 participants. Teams are competing to score the most points. The program begins with a short orientation, after which teams head out to find and answer the riddles. A one round version lasts 2.5 to 3 hours. A two round program lasts 4 hours. 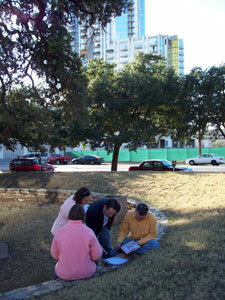 The Zilker Nature Sleuths activity lasts 4.5 hours. The last 30 minutes of a program involves scoring, awards, and a debrief. We end the program at the start location, your meeting location, or at a restaurant or lounge. Winning team members receive faux gold medals. Everyone gets a memento of the experience. The debrief at the end identifies effective team practices that helped score points. We draw on participants to identify how these skills apply in their work environment. Learning outcomes from the activity reinforce the value of effective planning, and demonstrate the benefits of being great listeners/communicators, checking assumptions, and seeking information from reliable sources. Let us solve the riddle of what program to do for your upcoming team activity. City Sleuths is the answer you’re looking for! Request a detailed proposal by using our contact sheet or calling Team Craft at 888­-400­-7077. Groups of from 6 to 160 participants organized into 3 to 5 member teams. Programs can last from two to five hours. Right out the door of your downtown hotel - within walking distance. The UT Campus and environs. Our Nature Sleuths program in beautiful Zilker Nature Preserve across Lady Bird Lake from downtown Austin. Download a City Sleuths Austin PDF Spec Sheet to share with others. I know other activities promote teamwork. However, I believe that the City Sleuths program was exceptional. I believe that the experience definitely helped to improve team performance. We learned who was strong in different areas, and that each of us was a contributory member of the team. The team was very happy with the detail and knowledge that was learned for our event. It was so fun and rewarding when we knew that we solved a riddle. The post-event wrap-up/award time was really enjoyable as well. Thank you for a wonderful afternoon! Everyone had a great time! It was the perfect way to show people around town and learn a bit about the city’s history at the same time. We’ve heard nothing positive feedback from our group! Thanks again. I just wanted to let you know that I have heard from most of my team and they really had a blast last Thursday. Our groups of 5 really were "tested" to follow rules, listen to each other, and work together - or not - depending on the individual. Thank you for facilitating this innovative teambuilding event. Janet HeinsMerck & Co., Inc.